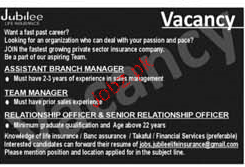 Assistant Branch Manager, Team Manager, Relationship Officers and Senior Relationship Officers are required in Jubilee Life Insurance in Rawalpindi. Send their cv with documents. You can apply online at vacancy after registering at http://www.jobz.pk site.